After recent Protests in occupied Kashmir and Killings of innocent Kashmiris by Indian Forces many Kashmiri leaders are caught by Indian Government. Indian Government has kept Kashmiri Hurriyet leader Syed Ali Shah Geelani in a cage after arresting him and is treating him very badly. Lawyers of Syed Ali Geelani told the Court of Srinagar on Saturday that 80 Year old Syed Ali Geelani is kept in a Cage by Indian Government and he is treated very badly. 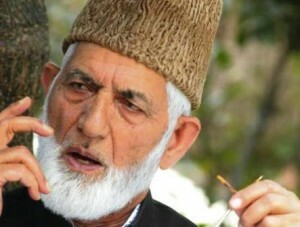 Lawyers of Syed Ali Geelani has challenged his arrest and demanded to free him from Cage. on other hand Indian Army has killed one more innocent Kashmiri youngster in Kishtwar area of occupied Kashmir. in some areas clashes between Kashmiri Mujahideen and Indian army has also took place.